Gandalf had the early lead, but Thorin’s army has pulled him into a dramatic 50/50 split! 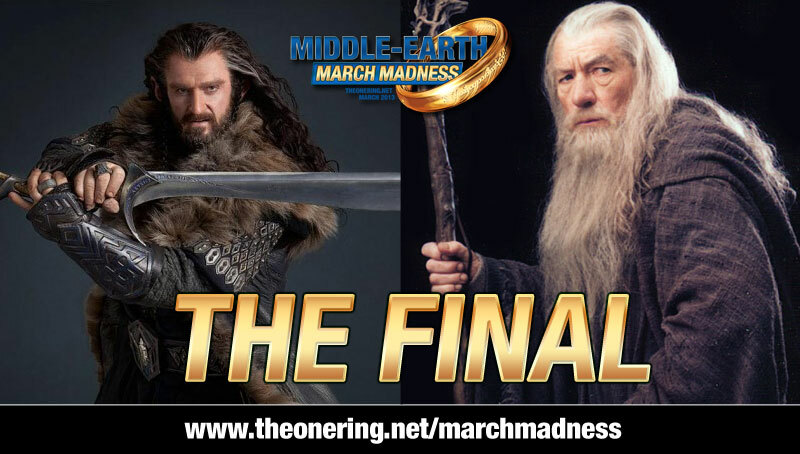 Who will win the 2013 edition of Middle-earth March Madness? Your guess is as good as ours. A note on voting. We implemented a single vote per user rule in the Elite Eight round. Behind the scenes, we can tell which users are abusing the system and voting much more than once. In all instances, those voters will have their votes stricken and counted only as a single vote. For this reason, we will not have a final result to share until Tuesday morning. Voting ends at 10pm ET tonight, so if you haven’t already voted in this classic match, place your vote today!